Depression is one of the most common mental illnesses. Sadly, many people struggle with depression for months or even years before seeking help. You cannot talk or think yourself out of your depression. You’re not weak. It’s not your fault. Depression is the leading cause of disability worldwide, and no one is immune. If your depression is severe or if therapy has failed, your doctor might recommend antidepressants. So how do these drugs work? 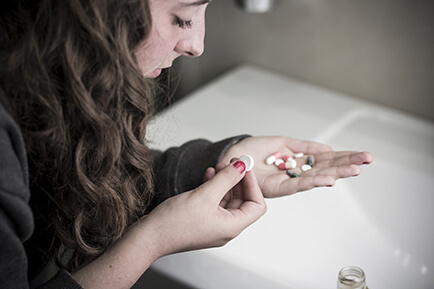 Here’s what you need to know about antidepressant use. There are dozens of antidepressants on the market, and for good reason. Not all antidepressants work for everyone. Depression is a complex disease that remains poorly understood. It can throw many brain chemicals out of whack, so the key with antidepressants is finding one that address your particular brain chemistry. Unfortunately, there’s no test for this yet. It’s a matter of trial and error. Don’t be discouraged if your first antidepressant doesn’t work. Instead, be honest with your doctor and open to trying something new. Research consistently shows that most people must try two-three antidepressants before they find one that works for them. Sometimes getting an antidepressant to work is a simple of matter of getting the dosage right. Most doctors start patients on a relatively small dose to monitor for side effects. From there, your doctor might steadily increase your dosing until you begin seeing results. If side effects become overwhelming, your doctor might opt to lower your dosing, or suggest pairing your current antidepressant with another drug. Antidepressants aren’t like painkillers or most other drugs you’re accustomed to taking. They’re systemic drugs, which means they need time to build up in your body to work. You won’t feel better an hour or even a day after taking an antidepressant. If you do, it’s nothing more than a placebo effect. Most antidepressants need 2-3 weeks to accumulate in your system, and maybe even more if you’re starting with a small dose. One unfortunate reality of antidepressants is that, like all medications, they come with side effects. For many patients, these side effects appear early. They often go away after a week or two, so unless the side effects are severe—intense headaches or aggression, for example—or life-threatening—seizures or loss of consciousness—consider sticking with the drug for another week or two. Always advise your doctor of any side effects you experience, since there may be steps you can take to reduce the severity of certain side effects. Getting plenty of sleep each night, and maintaining a regular sleep schedule; don’t oversleep. Getting plenty of exercises; some studies show that exercise is as helpful for depression as antidepressants. Being socially active and working to cultivate new friendships. Working a job, even if it’s not your dream job. Getting up and going to work every day can boost self-esteem.